Phang Na province is situated on the west side of the Malay Peninsula in Thailand, and includes various islands of the Phang Na Bay.It is a place of immense beauty with lime stone peaks emerging from the azore seas of Phang Nga Bay.The Ao Phang-Nga (Phang-Nga Bay) National Park was established in 1981 to protect the multitude of islands present in the vicinity. The Similan Islands are part of Phang Nga National Park and offer some of the best scuba diving locations in Thailand and Southeast Asia in addition to possibly the best salt water fishing grounds found in Thailand.Phang Nga Bays location in the Andaman Sea ensures that it has the most remarkable of scenery with mangroves,limestone mountain ranges and unspoilt sandy beaches bordering its coastline. Phang Nga is an ethnic melting pot of various religions and cultures with a mixture of Thai-Buddhist,Thai-islamic,Sea Gypsy and Muslim communities all living in harmony.Food in Phang Nga is traditionally a mix of Spicy Southern style cooking with rural influences.With the various ethnic influences found in Phang Nga it is ensured that various ethnic festivals are held throughout the year celebrating the various faiths and traditions. 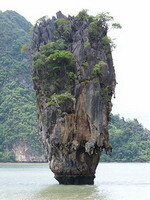 The weather in Phang Nga is best through the months of November-April with the raining season falling between the months of May-October.